Many patients associate whiter teeth with youth, beauty and good health. Bleaching (whitening) techniques are often the first treatment to be undertaken before further aesthetic dental treatment. Not only is there aesthetic gain at minimal risk and cost, but it preserves tooth structure and simplifies restorative procedures. Age-yellowed teeth and naturally darker teeth respond better to bleaching than grey or blue tinted teeth. Bleaching uses chemicals to more permanently (generally three to four years) change the colour of your teeth. It is important to understand that bleaching is not appropriate for everybody. Major advantages of bleaching over other restorative techniques are that they preserve tooth structures and are easy to monitor. It is indicated for those patients who wish to have whiter teeth. It is one of several methods for improving a person’s smile. It has been used successfully in treating discoloration caused by congenital, systemic, metabolic, pharmacological, traumatic, or iatrogenic factors. The whitening procedures should be done before aesthetic/cosmetic procedures are done. This procedure is done in the surgery and takes arelatively short time—between 45 min to 60 min. 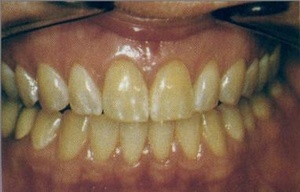 Some patients can not tolerate bleaching trays or will not comply with home care instructions. It is faster with more immediate results but may have to be followed up with home bleaching. 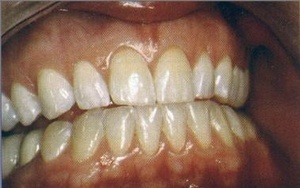 By using special fitting trays and bleaching gel, the patient can do bleaching in the comfort of their home. Extensive research had been conducted into the home bleaching technique which showed that it was safe, effective and worked extremely well. It will enable the correct diagnosis of discolouration. Inappropriate treatment will be avoided. Baseline settings and radiographs can be evaluated. Better materials available to dentist can be used. Customised mouthguards can be made avoiding irritation of gums. No large fillings on front teeth. Little or no dental disease on front teeth. No excessive gingival/gum recession or tooth sensitivity. Minimal coffee, particularly black coffee, consumption. Most importantly, realistic treatment outcome expectations. Treatment should be avoided on pregnant patients.